Is your idea of heaven putting your feet up with a packet of biscuits and a large Cappuccino or Latte variety, then this is the thermometer for you. Unfortunately it does not come with the packet of biscuits but it can help you ensure that your Cappuccino & Latte does not taste of scalded milk, or just warm milk. 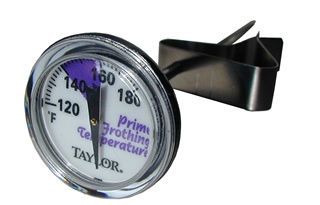 The stainless steel stem is 5" long, has a prime frothing section highlighted for the at-a-glance easy reference, so you will know when the milk is the correct temperature.